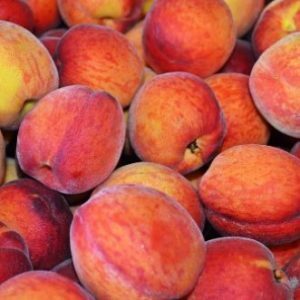 June 26, 2015 0 comments on "How to Freeze Peaches"
When we go camping each summer, we like to stop at a favorite local fruit stand and buy a 20-lb box of fresh peaches. After enjoying some delicious peach milkshakes and making some peach jam, I decided to freeze the extra peaches. So I brought home so I could look up just how to freeze peaches. Freezing peaches ensures that you have peaches for smoothies and your favorite desserts all winter long. Peaches are very easy to freeze. If you have some extra peaches and need to do something with them in a hurry, you can prepare them for the freezer in no time. There are a number of ways of freezing peaches, but the easiest way is to just pack them into freezer containers. Four cups of peaches will fit into a 1-qt freezer container. One medium peach is approximately 1 cup. Choose firm, ripe peaches that haven’t begun to spoil or turn brown. Peel and pit the peaches and slice them into the large measuring cup until you have 4 cups. Slice just enough to pack into one freezer container at a time to prevent browning. (I love these inexpensive freezer containers you can order from Amazon). 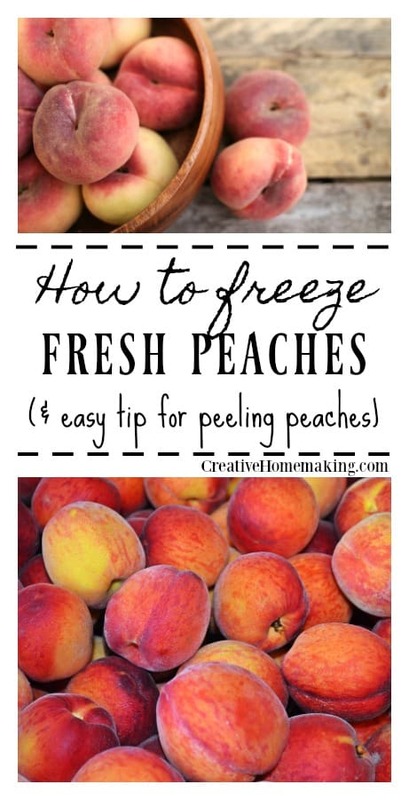 You might wonder if you can freeze peaches without peeling them. Honestly, I don’t see any reason to leave the peels on when it is so easy to peel them with this easy trick. To peel the peaches more easily, dip them into a bowl of boiling water for at least 30 seconds and then dip them into a bowl of ice water. The skins should slip right off as long as the peaches are ripe. After you have prepared the peaches, stir in 1 tablespoon of Fruit Fresh. Fruit Fresh is a powder that preserves the color of the peaches, keeping them from turning brown. You can find it with the canning supplies at your local grocery store or you can order it online from Amazon. Next pack your freezer container and place the lid on top. Label the container with the contents and date. Peaches frozen by this method will last up to 6 months in the freezer.